By Dale Johnson Posted: October 31, 2017 3:00 p.m.
To help you remain healthy and reduce your chances of contracting influenza and spreading the infection the U of R is again providing free flu shots for students, faculty, staff, volunteers, and their families. The flu is a common and highly contagious respiratory disease that affects the nose, throat, and lungs. Flu symptoms usually last for five to seven days, but it can take one to two weeks to fully recover. Most people get better with no lingering issues, but sometimes the flu can lead to an ear infection, a sinus infection, bronchitis or even – in rare cases – pneumonia. A flu shot helps not only you, but also other people. That’s because even if you are healthy, you can spread the flu to people who are at greatest risk for serious complications or even death, including young children, the elderly, and those with significant medical conditions. Influenza viruses change over time, and that's why there's a new influenza vaccine made every year to protect against the current virus strains. This flu season in Canada may be worse than average, because Australia and Hong Kong have had one of the worst flu seasons ever. What happens in the Southern Hemisphere often indicates what will happen in the Northern Hemisphere. The U of R’s first flu shot clinic this fall, on October 23, saw more than 1,000 people turn out to be vaccinated. There is no charge to get a shot. Please wear short sleeves and bring your health card. If you don’t have one, you can still receive a shot. 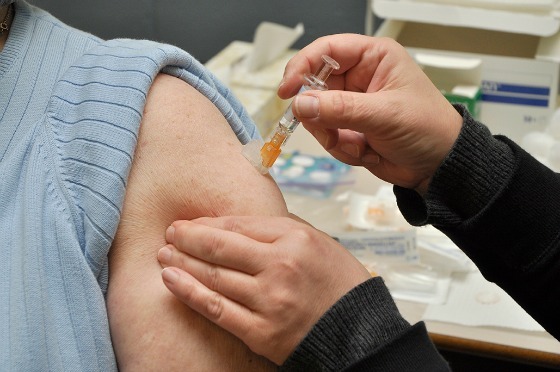 Getting a flu shot helps to limit the spread and debilitating effects of the flu. Get yours!